A recent study states that email databases decay naturally by 22.5% every year. Sending emails to such decayed, invalid, broken, mis-spelled email addresses leads to increase in number of bounces, complaints, and spam trap hits. Now, when these numbers exceed the threshold set by ISPs, your emails may be sent to the spam folder or may even get blocked! This causes poor deliverability which means poor engagement. Another study reveals a shocking fact- 73% of companies have issues with email deliverability. Are you one of them? 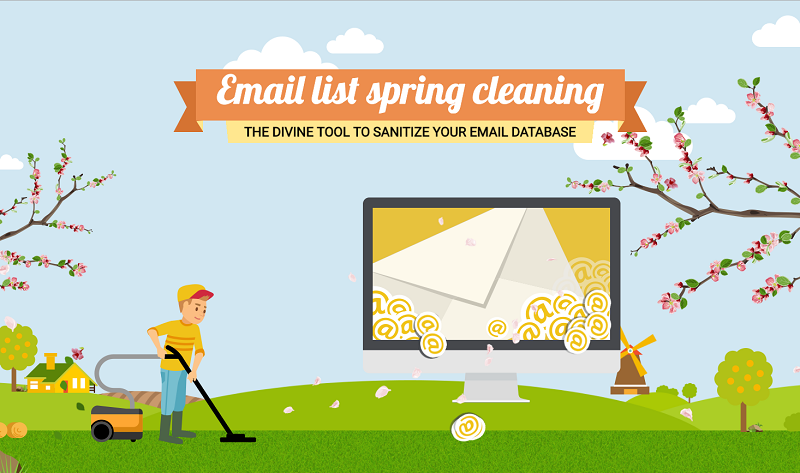 Email list cleaning can help you steer clear of all these obstacle. A clean email list not only improves inbox deliveribility and response rates but also safeguards against blacklisting. Email list cleaning isn’t rocket science but it needs to be done correctly and timely- just like you spring clean. But not all marketers see the desired results in spite of practicing list cleaning. Why? Probably because they are not doing it right! A squeaky clean email list can prove to be more profitable for marketers than it appears on the outside. Spruce up yours with this EmailMonks infographic and sow the seeds for success.